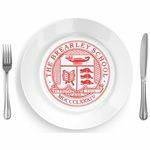 The goal of Brearley’s food service has always been to provide a variety of wholesome, nutritious and homemade foods. We serve numerous daily choices and incorporate organic and locally produced foods in our offerings. We strive to please and excite the taste buds of our diverse community. We view our responsibility as educators to develop a respect for food and its role in the environment. Our passion for the culinary arts and dedication to the Brearley family inspire us to do our part in educating palates and minds and advancing food awareness. We invite you to explore our dining services page, and we all look forward to another delicious school year! Place all of the ingredients in a food processor and blend until smooth. Serve with whole wheat crackers or fresh cut veggies as a dip. Tip: Try as a sandwich spread or toss with pasta. Place all sliced fruit in an 18 qt. pail. Add 4 gallons of chilled water and mix well. Stir rosemary in 4 cups of boiling water for 3 minutes (any longer and rosemary will turn brown and bitter) and add to mixture. Mix and garnish with frozen white grapes. turnips and potatoes are fork tender. Blanch Brussels sprouts in boiling water, drain and reserve. Heat olive oil in a large non-stick pan over medium heat. Add onions and saute for about 5 minutes. Add garlic and Brussels sprouts and saute until Brussels sprouts are tender. Add lemon juice, parmesan cheese and bread crumbs, saute for another minute. Peel and cut Local White Sweet Potatoes into medium size pieces. Bring to a boil. Drain and cool. In a food processor add sweet potatoes, lemon juice, lemon zest, olive oil, cumin, cilantro, salt and pepper to taste. Serve with whole grain pita bread or flat bread. Serve as a dip with any of your favorite fresh crudités. Great on greens and tofu as well. Add sweet potatoes, yogurt, banana, pineapple, pineapple juice and honey into blender. In a mixing bowl combine yogurt, eggs, mustard, garlic, and salt & pepper. Pour yogurt mixture over chicken and marinate for 30 to 60 minutes in a refrigerator. In another bowl mix the breadcrumbs, Italian seasoning and Parmesan cheese. Remove marinated chicken from the refrigerator. Place breadcrumb mixture in a hotel pan. Remove excess yogurt from the chicken and coat tenders evenly with the breadcrumb mixture. Place breaded tenders on a lightly sprayed cookie sheet and bake for 12-15 minutes. Turn chicken tenders over once, and return to oven for another 12-15 minutes. Toss together with garlic, olive oil and salt & pepper. Place on a sheet pan with parchment paper. Roast for 20–25 minutes until cauliflower florets are golden brown on the edges. Cool and place roasted cauliflower florets on a serving platter or bowl. Soak raisins in warm water for 10–15 minutes. Add all ingredients into a blender and blend well. Pour vinaigrette over roasted cauliflower. Mix together all the ingredients in a bowl except for the Raisins and Craisins. Spread the mixture out on two sheet pans lined with parchment paper. Bake in a 300° oven for 15 minutes. Remove from the oven and mix the granola with a spatula or a spoon. Remove from the oven and mix in the Raisins and Craisins. Serve with yogurt, fresh fruit, hot and cold cereals. We are proud to cook with hormone- and antibiotic-free meats. This includes chicken, turkey, beef and pork. See our weekly menus for details. All meats in our sandwich bar are lean and nitrate free. We encourage eating a wide variety of plant-based foods by serving delicious vegan and vegetarian items everyday. Our tofu is organic and not made with genetically modified soybeans. We provide rBGH and rBST-free milk, meaning the dairy cows are not given artificial growth hormones. Skim, 1%, organic soy and organic milk are available everyday. An assortment of organic whole grains is featured throughout our menu. Be sure to try grains such as whole wheat couscous, farro, quinoa, and millet. We exclusively serve organic hard boiled eggs and Safe Catch low-mercury tuna. Weekly menus are reviewed by a certified nutritionist to ensure dietary balance. Each day we feature two homemade soups. One soup offerings is always vegetarian. Olive and canola oils are exclusively used in all food preparation. We serve high protein, multigrain pasta that is rich in omega-3 fatty acids. Chicken tenders are breaded and baked in-house using our chef’s special blend of whole wheat and panko breadcrumbs. Homemade granola is served in our organic yogurt and fruit bar. It is baked in the Brearley ovens using our own recipe of whole oats, wheat germ, dried fruits and sunflower seeds. Our famous Bagel Muensters are now prepared on whole wheat bagels. For the past three years, we have partnered with Consalo Farms in Vineland, NJ, to bring seasonal, local produce to our students. We also purchase a wide variety of New York grown fruits and vegetables from the GrowNYC Greenmarket. Be on the lookout for different selections featured as the seasons change! New this year we will be sourcing all of our tomato products locally! All of our tasty tomatoes were harvested in New Jersey this summer and canned for preservation. Available each day are many organic products such as yogurt, dairy and grains, lowering our exposure to potentially harmful pesticides and chemicals. When purchasing fish we always reference the Monterey Bay Aquarium’s "Seafood WATCH" guidelines to ensure that we are procuring healthful and sustainable seafood. All of our condiments are served in bulk containers rather than individual packages. For many years the water supply for the food service has been filtered. This provides us with higher quality water and eliminates our need for bottled water. Our light-juice beverages are received in bulk packaging and are custom blended in-house. The Brearley Café proudly brews fair trade coffee daily! Resources are conserved as we utilize china plates, non-disposable glassware and stainless steel flatware as opposed to disposable paper products. When the use of paper products is unavoidable we use biodegradable “green” paper products. Our dishes and equipment are sanitized with “green” chemicals, which are 99.7 percent phosphate and phosphorus free. This means they are not dangerous to our water system and ocean life. Additionally, our dishwasher contains live enzymes that naturally break down grease without the need for chemicals. Two years ago we went trayless! As a result, we have drastically reduced our use of cleaning chemicals, water, energy and food waste. Our walk-in refrigeration is equipped with air curtains designed to keep cold air in, thus conserving energy. We make sure to turn off all equipment and lights in the kitchen when not in use. All kitchen equipment is maintained to ensure that it runs at maximum efficiency. When replacing outdated equipment we seek out more energy-efficient models. We have always used the Department of Sanitation’s recycle program to its fullest. Unused food is donated to City Harvest to help feed the homeless.